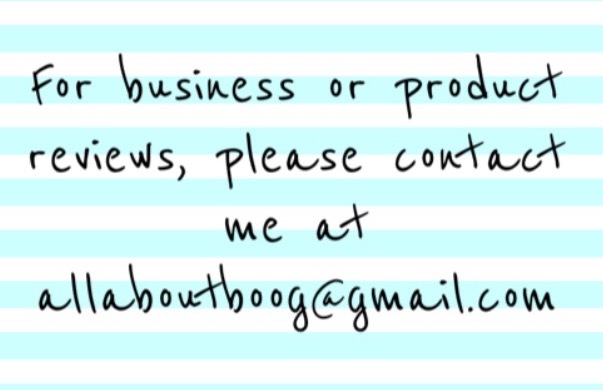 No Matter the Topic, it's All About Boog: They Like Me! They Really Like Me! I seriously could not be more honored! 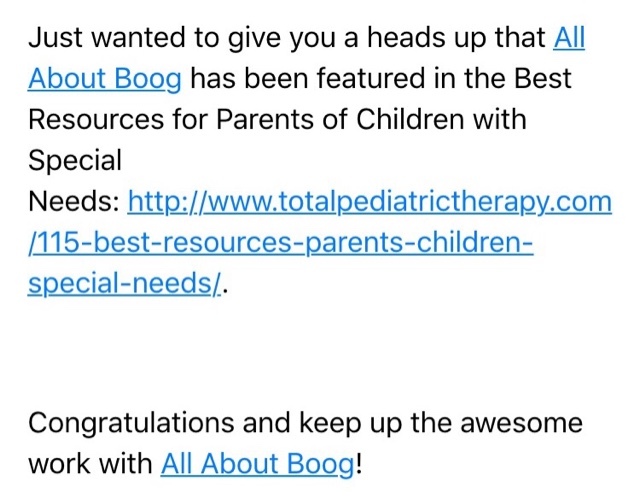 The email basically told me that "All About Boog" has been included in the "115 Best Resources for Parents of Children with Special Needs" list created by Total Pediatric Therapy! "Total Pediatrics strives to define quality therapy. As our name implies, we offer the total package. Our therapists are not just therapists; they are the best at what they do. Your child’s health and development is not to be taken lightly. You’re picky about your doctor, why not your therapy team too? You are in control of your child’s development. We provide client-centered care. Our therapists are involved in continuing education programs far beyond what is mandated by state and national boards. Our therapists are passionate about multidisciplinary care, including nursing, nutritionists, and physicians in all decision-making. Our therapists are connected to quality professionals of other disciplines to ensure a thorough plan of care. Our therapists are equipped to utilize telehealth. Our therapists are committed to researching cutting-edge programs, yet equally skilled in tried-and-true traditional approaches to health and wellness. 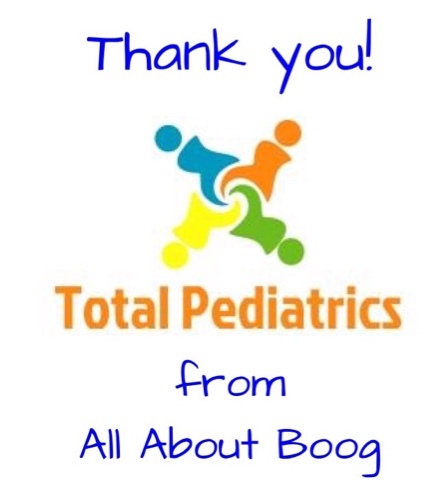 At Total Pediatrics, you get the total pediatric package without sacrificing quality." In my thank you reply I mentioned that my journey with Boog has been filled with many ups, downs, smiles and tears. I decided to blog about all of those aspects to give a truly realistic view of being a parent of a child with Autism. Blogging about only the good days would be a half-truth. It also wouldn't help my target audience: Parents with special needs children who are often overwhelmed, worried about the present/future, looking for ways to pay for expensive therapies and frequently feeling isolated or alone. If a person under that sort of stress has no one they can relate to, it can often lead to them believing their feeling/worries aren't valid. ex. : "She blogs all the time and she's happy. Her son's therapy is going great. What is wrong with me? What am I doing wrong?". I really applaud Total Pediatric Therapy for creating a one-stop-shop of so much helpful (and often hard to find) information. The list contains 115 real-world resources pertaining to Autism and/or special needs children. This is extremely valuable information to so many parents and caregivers who may not have any idea where to start (I was one of them and still am sometimes!). 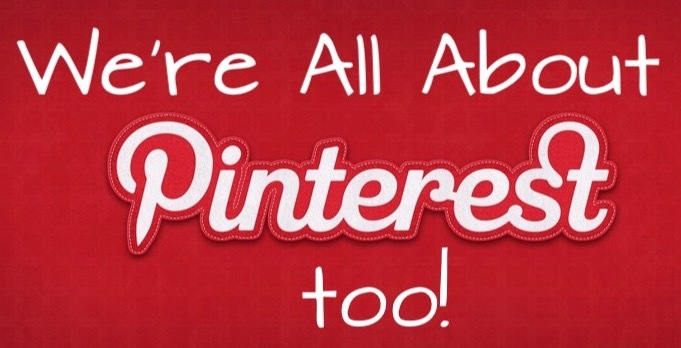 Please check out their link below and don't forget to share it. It contains pertinent information and resources helpful to anyone with a special needs child in their life.